Properties in Radicofani average 4.7 out of 5 stars. 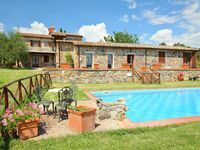 Villa with private pool, hot tub, air conditioning, Wi-fi in Val d'Orcia. 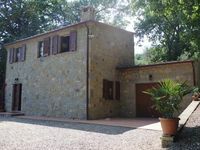 Property 4: Villa with private pool, hot tub, air conditioning, Wi-fi in Val d'Orcia. Property 6: Historic House in the heart of Valdorcia near Pienza and Montepulciano. Property 44: Farmhouse "Podere Casano"
La propri&eacute;t&eacute; a correspondu parfaitement au descriptif et &agrave; notre attente. Seul b&eacute;mol, le prix de l'&eacute;lectricit&eacute; lors de notre d&eacute;part nous a paru &eacute;lev&eacute; 0,75 euro le KW/H. Nous ne connaissons pas le prix r&eacute;el en Italie mais 500 euros pour 2 semaines, (en faisant attention), en sus de la location, nous a paru assez cher. Silvano's house was just as shown in the photos. Clean and with all kitchen utensils. He met us on the edge of town and lead us to the house about 5 km. Away. He showed us the house and told us about the area. Theres a grocery store in town where you can buy essentials for the kitchen. Overall we had a wonderful time and would highly teccommend his place.